We’ve all experienced it: That eerie feeling that something or someone was watching us; that an inanimate object had, in actuality, come alive. 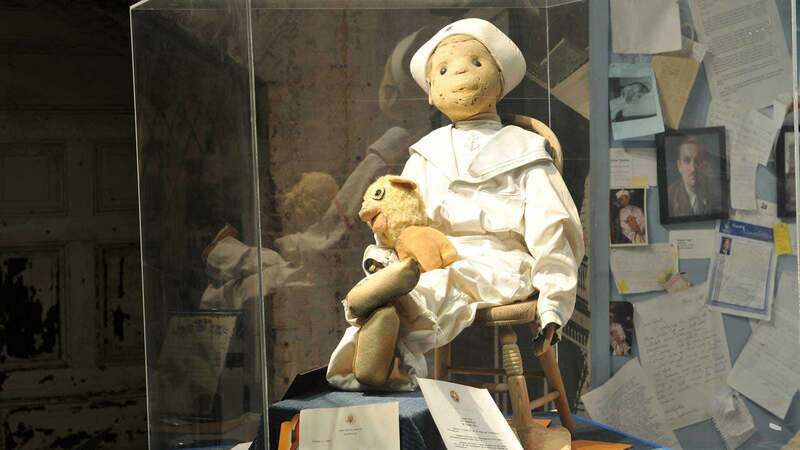 In Key West, many have not only experienced that feeling, but have also witnessed it when viewing the famous toy – Robert The Doll. Grab a seat aboard the Trolley of Doomed and get a first-hand look at Robert the Doll. Our nightly ghost tours visit him at the East Martello Fort along with a variety of other haunted places. The story of Robert the Doll dates back to the early 1900’s when a young boy named Eugene Robert Otto was given a one-of-a-kind handmade doll by a servant that worked for his parents in his home. Eugene, who everyone called Gene, named the doll Robert and quickly became attached to his new friend. The home where Eugene lived, now called the Artist’s House, is located at 534 Eaton Street and was built between 1890 and 1898. It was here that Eugene was given Robert The Doll and where a friendship that lasted throughout his lifetime… and beyond was forged. While he seemed like an ordinary cloth doll, it wasn’t long before Robert was involved in strange and somewhat terrifying events. The first hint that something out of the ordinary was happening was one night when Gene, who was only ten years old, awoke to find Robert the Doll sitting at the end of his bed staring at him. Moments later his mother was awakened by his screams for help and the sounds of furniture being overturned in her son’s bedroom. Gene cried for help, begging his mother to rescue him. When she finally was able to wrench the locked door open, she saw poor Gene curled up in fear on his bed, his room in shambles and Robert The Doll sitting at the foot of the bed. “Robert did it,” were the only words Gene could get out – the same words he would later use, many times throughout his childhood, when something strange, mysterious or destructive would happen. Nobody knows for sure why or how this child’s plaything could actually wreak havoc on a child’s bedroom or do anything at all; after all, it was just a toy, right? But the weird and inexplicable didn’t stop at that one occurrence. Gene’s parents would often hear their son upstairs talking to the doll and getting a response back in a totally different voice. They reported seeing the doll speak and witnessing his expression change. Giggling and sightings of Robert running up the steps or staring out the upstairs window were also reported. Robert continued to live with Gene throughout his lifetime and after Gene’s parents died, he moved back into their home with his wife, Anne. Gene decided that the doll needed a room of his own and placed him in the upstairs room that had a window overlooking the street. Anne felt uneasy with Robert in the house and although she couldn’t put her finger on it, she wanted Gene to lock the doll up in the attic where he could do no harm. Gene conceded and as one could imagine, Robert the Doll was not happy with his new digs. Soon, visitors to the home heard footsteps in the attic, the sounds of someone pacing back and forth and devilish giggling. Neighborhood children reported seeing Robert watching them from the window in the upstairs bedroom and told accounts of the doll actually mocking them as they walked to school. When Gene heard this, he immediately went to investigate, knowing that he had locked Robert in the attic and there was no way he could be sitting by the window of the upstairs bedroom. But to his complete shock, when he opened the door to the bedroom, there was Robert, sitting in the rocking chair by the window. Gene locked Robert back up in the attic several times; each time discovering him again sitting by the window in the same upstairs bedroom. Gene Otto died in 1974 and when a new owner moved into the house on Eaton Street, their ten-year-old daughter was delighted to find Robert the Doll in the attic. But her delight ended soon when she claimed that Robert was alive and that the doll wanted to hurt her. She awoke often in the middle of the night screaming in fear and told her parents that Robert had moved about in the room. It wasn’t long before Robert the Doll was given away – and today he lives in the East Martello Fort where visitors from all over the world come to see him. Many believe that the origin of Robert’s evil lies in the one who originally gave him to Gene Otto – the servant who worked for Gene’s parents. This woman was supposedly mistreated by her bosses and to punish them it is believed that she cursed the doll with Voodoo and Black Magic. That might explain the many mysterious and frightening experiences people have had with Robert the Doll; but if so, wouldn’t the haunting end when the owners died? No one really knows for sure. But one thing remains constant: Robert The Doll continues to taunt and scare those who come to view him – especially guests to the museum who attempt to take photos. Many have reported their cameras becoming inoperable when they tried to take a picture of Robert, only to begin working again when they left the museum. Robert The Doll sits inside a glass case; but it doesn’t seem to stop him from inflicting fear and discomfort to museum staff and visitors. Staff members report that Robert’s facial expression changes, hearing demonic giggling and have even seen Robert put his hand up to the glass. Get your seat aboard the Ghosts & Gravestones Tour and you’ll have a chance to meet Robert for yourself. 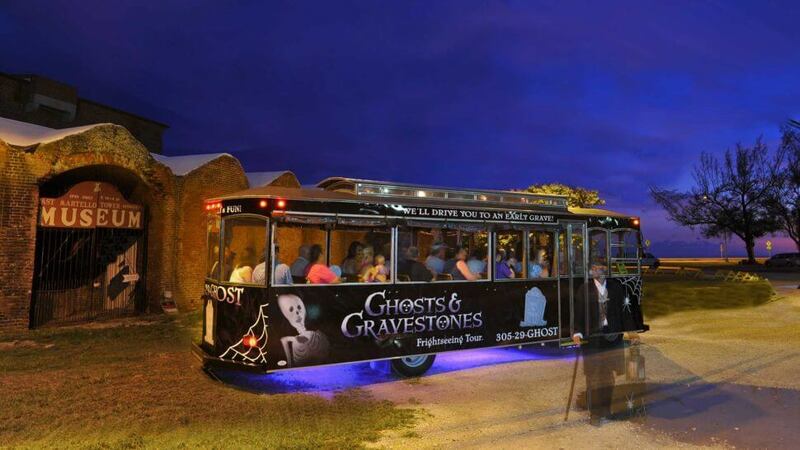 During the tour, the Trolley of the Doomed stops in on this mischievous toy at the East Martello Museum, among the many other haunted spots in Key West. Visitors are welcome to view Robert in his special case at the museum and of course encouraged to try and get a photo. Though, most who’ve tried have been unsuccessful. If nothing else, get a close look at Robert and watch him carefully, try to catch a glimpse of him smirking at you, moving about in his case or watching you as you watch him.